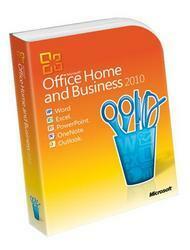 Microsoft Office Home and Business helps you stay connected and productive — at home, at the office, and on the road.1 Tackle your busy agenda efficiently with Outlook 2010 email and scheduling tools and the programs you rely on to express your ideas professionally. · Create a business budget or track personal expenses easily with ready-to-use templates in Excel 2010. · See data trends quickly with powerful analysis tools, such as Sparklines that show a tiny chart embedded in a cell, Slicers that filter data in a PivotTable, or Conditional Formatting to help you easily spot variances. · Illustrate your information with improved charting tools and SmartArt® graphics to make charts, diagrams, and graphs that are easy to understand and read.